2/21/2011 (Las Vegas, Nevada) - Family owned since new. 18,492 documented miles. This is an original unmolested, unmodified 1990 Lotus Esprit SE with the 2.2 liter 4 cylinder Turbo engine mated to a 5-speed transmission. Comes complete with all books, keys, maintenance records and top cover. Locally owned and serviced here in Las Vegas. This Lotus looks and drives brilliantly. Paintwork, with the exception of a few paint chips, is original, has great shine and is outstanding overall. The interior leather is excellent. The dashboard is in great condition and all the gauges work. The woodwork is showing signs of the clearcoat cracking. Carpets, headliner, door panels, console are all in perfect shape. 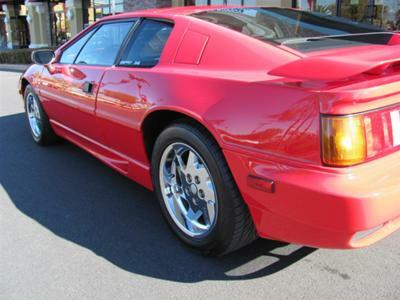 If you are looking for an exceptionally original Lotus Esprit with low miles to show or drive - buy this now while you can!